Koi Palace is the #1 Chinese Dim Sum restaurant in the San Francisco Bay Area. The Peninsula is ground zero for some of the best Chinese food in the San Francisco Bay area. Koi Palace has been around since 1996 and specializes in wide selection of Dim Sum for lunch and special dishes for dinner. They also have locations in Dublin and at the Thunder Valley Casino. Koi Palace Dinner is reviewed separately. Dragon Beard candy creation is covered too. Our last visit was in spring of 2017. Be sure to read our Introduction to Chinese Dim Sum tutorial. Koi Palace has a printed menu that you can order on, plus a number of carts, servers carrying dim sum around. We had to order only a couple items via the printed menu. On a visit midweek, we had to order most items from the menu. This place is a very busy and a super noisy Chinese restaurant with lots of families and friends eating together at Koi Palace Dim Sum. Above average decor for a place like this. Wish the bathrooms would be as clean. People have trouble aiming here. Lots of flat screen TVs, big tanks of seafood by the entrance. Their tanks are not as well stocked as in days gone by. You see some dead fish these days. On a Saturday, we arrive 5 minutes before they opened and found a line by the door. On another occasion, We arrived on a Sunday at 10am (They opened at 9am), and had to wait 30 minutes to be seated. Parties of 2, seemed to get seats fast. Come toward the end of lunch to get in quicker. Coming late may make them freshly steam or fry items for you! We came right before the Autumn Moon Festival on one occasion, so they were selling lots of moon cakes. Koi Palace had an expert hand making Dragon Beard Candy. 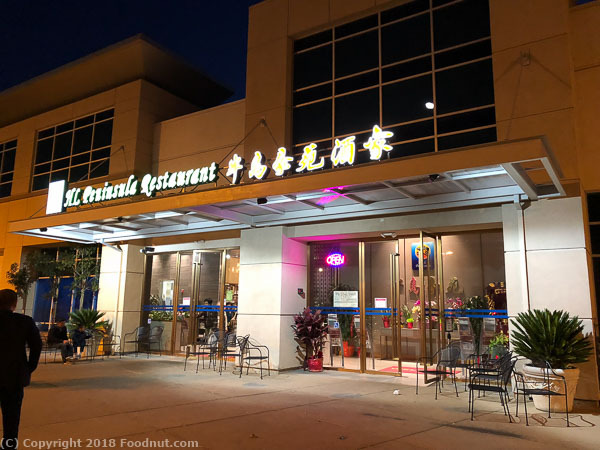 While we went for Koi Palace Dim Sum lunch, they also have extensive, fancy, and expensive dinner menus with meals for tables of 10, at prices up to $678. You’ll get top notch ingredients in your meal, but won’t get service like Gary Danko. Koi Palace has a huge menu of classic dim sum to modern dishes, something for everyone, including vegetarians. Not all items come to the table on the carts, so you need to check off items you would like to order on the menus. This is especially true in the afternoon around 1pm. Dim sum prices are on the high side, priced from $2.95 (Small) – $6.20. (XL) BBQ $7.20. Prices have risen each year. Originally Cantonese, Koi Palace has branched out into other areas including having Sichuan dishes as more Mainland Chinese dine here. Koi Palace charges from $1.25 to $2.25 per person for tea. Kids are even charged. They do have a nice selection of tea from the usual Oolong Tea to Ginseng Jasmine to Monkey Picked Ti Kuan Yun. Shanghai Steamed Dumpling Sampler ($9) had 5 colorful xiao long bao – Black Truffle, Crab Roe, Juicy Pork, Fresh Beets, and Kale. We figured this was a fun dish to try and ordered it. They cheat by placing them in large spoons.. You have to use a napkin to move these hot spoons. The dumplings were hot and full of good soup. The Kale had a strong veggy flavor, while the others were more mild. A fun dish to order. We cannot wait till Din Tai Fung opens in Westfield Valley Fair later this year. Sugar Egg Puff ($4.95) – A signature dessert here with powered sugar on top. Crunchy and fresh out of fryer. A must, so save room for it or just order it first! These are freshly made, so do not order them until you are ready for dessert. Durian Puff Pastry ($6.90) still possessed that fragrant odor that some call stinky. This pastry was quite crispy as it was freshly fried. Must order if you love durian. Durian Glutinous Balls ($5.80) is a variant to the above. While not as fragrant, it is more of a chewy dish for those who want to avoid deep fried food. Bird’s Nest Egg Custard Tart ($7.80) was something that we tried recently at Cuisine Cuisine in Hong Kong. This version was not as good, were you surprised? Probably worth saving your money for your trip. Spinach dumpling ($3.80) featured a sticky glutinous wrapper along with some nice fresh shrimp inside. A nice change from the usual shrimp version. Sichuan Spicy Seafood Dumplings ($7.80) shows Koi Palace’s movement beyond traditional Cantonese dim sum. This is a pretty good dish for those who like hot dumplings. Fish Balls ($5.50) has lots of fish balls, daikon, pork skin, and other goodies. Pretty delicious. Espresso Coffee Ribs ($8.80) are done well here. Freshly fried with a medium strength coffee flavor. The portion size is a lot more manageable compared to dinner’s huge plate. Still a very meaty lunch dish when many people want bite sized eats. Boiled Beef Tripe ($8.80) is a great dish for tripe lovers. Pretty liberal amount, along with a spicy soy sauce for dipping. Shredded Duck Burrito ($6.90) was a unique Northern style dish, essentially Peking duck with cucumber put in a scallion Tortilla. Good quality ingredients, could have used more duck though. Crispy Glutinous Puff (Ham Soi Gok) ($4.60) – What a translated name. Fresh and hot out of the fryer. Crunchy, not as big as other places. Good meat filling. Best version we have had around the SF Bay Area. Better than Zen Peninsula. Shrimp Rice Roll (Shrimp Chung Fun) ($6.25) – The noodles were pre-chopped into many pieces, huge fresh shrimp, not too oily. Most restaurants use cheaper and smaller shrimp. Top notch. Lots of a slightly sweet soy sauce. Stir Fried Rice Roll with XO Sauce ($6.80) had a hit of spiciness to this rolled noodle dish. Good but not as good as the one at Champagne Seafood in San Mateo. Sticky Rice with meat ($6.80) – Came under one big glass bowl with decent tasting pork, dry shrimp, eggs, and other goodies. Frankly, the lotus leaf sticky rice is better. Wild Mushroom Stuffed filo threads ($4.50) was a weird looking dish. The outside was full of super crispy filo threads, the inside had a mushroom spring roll. The internal dough was also fried. Could have been better but still worth ordering, especially if you are a vegetarian. Lotus wrapped Sticky Rice ($5.80) had two good sized portions. It was hot out of the steamer and perfect. One of the best around the San Francisco Area. Rice, meat, mushrooms, egg were all fully cooked to our liking. Shrimp Dumpling – Har Gow ($5.80) were four medium sized shrimp dumplings. Perfect wrapper and filling. Top notch bite sized morsel, making it a must order item for most. On our last visit, it was too hot and lacked the delicacy of the past. Sea Scallop Dumplings ($5.80) were 3 huge dumplings filled with chopped shrimp and half scallop. Nicely done, a nice variation on the har gow. Steamed Shrimp Dumpling topped with XO sauce ($6.25) is also another variant of the old har gow. Pretty cool looking and a bit of a kick too. Sharks Fin Dumplings ($6.50) is not PC these days, but this one was very good. Large piece of real sharks fin, huge dumpling with shrimp, mushrooms, and more. Excellent broth. Fried Twisted Dough Bun (Man tauw) ($4.30) – Deep fried bun with sweet condensed milk for dipping. Awesome dish, very good when fresh and hot. Fresh Mango Pudding ($3.60) – 4 little pieces. Another good dessert with condensed milk on the side. Not too sweet, good mango flavor. Shanxi Style Date cakes ($5.80) is not found on many menus up here. We had some at the excellent Sea Harbour in Rosemead. Jiggly brownish slices of slightly sweet jello-like dessert. Strong date flavor. Manila Clam Congee ($15) was a huge bowl enough for 4+ people. Great jook flavor, reminding us of the stellar porridge in Hong Kong. This gets you close. Lots of large clams too. Yau Tiu ($2.80) – Chinese deep fried doughnut is usually eaten with congee. This one was freshly fried, piping hot and really good. Crispy fried tofu skin ($5.80) was a good-sized plate full of thinly layered deep-fried goodness. Not for everybody. Some people might prefer the salt-and-pepper version. Steamed Daikon ($4.50) – We ordered this by accident but found it pretty good. More of a hot daikon pudding than the traditional pan fried cake form. Diced pork & Peanut filled Dumpings in the Chao zhao style ($3.80) featured 3 large dumplings filled with peanuts, cilantro, pork, and a slight zest. One of the better versions around. Hard to remove intact. Egg custard tart ($2.95) included 3 tiny but tasty tarts with a flaky pastry shell. Not as good as legendary Golden Gate Bakery in San Francisco, yet extremely good. Egg yolk lava bun ($4.80) were very good and pretty big. Their buns utilize a harder texture surface than others. Pork ribs in black bean sauce ($2.95) was a decent dish, a bit on the greasy side but reasonable quantities of tender pork. Deep Fried Sesame Balls ($5.80) – In 2016, hot, straight out of the fryer. Thick skinned, filling not too sweet. A very good version of the classic with a crispy shell. Sometimes they are not freshly made and quality suffers. Prices have gone from $2.95 to $5.80 for this dish! Diced Pork and Peanut filled Dumpling Chiu Chow style ($3.95) had four medium sized dumplings that were all stuck together initially. These were OK, not particularly great. Steamed Shanghai Dumplings or Xiao Long Bao ($4.50 for 4, $8.80 for 10) were 4 tiny but decent dumplings. These little balls were cooked in a silver foil wrapper, keeping the internal juice from leaking out – Cheating! The large meat chunk was also tasty. Not an authentic dish nor was it as good as dumplings from a place like Shanghai Dumpling Shop in Millbrae. The ones in China or at Din Tai Fung in Bellevue are not this big. Hand Roasted Duck ($5.50) was and ok dish. Quantity was ok but the meat did not taste special, pretty average. Steamed Daikon Cake ($3.60) – A good dish, not a lot of meat mixed in with Daikon. Did not taste home made. Pan Fried Pumpkin Cake ($3.60) had 4 very sweet and sticky cakes with pumkin flavor and very sweet insides. Steamed BBQ pork buns ($2.95) were average mainly because they featured shredded pork interiors of average quality. Being Char Siu Bao Snobs, our current favorite is at Hang Ah tea Room, The oldest Dim Sum Restaurant in San Francisco. 2 for a ridiculous $3.95. Ginger egg barbecue pork puff ($4.80) was an interesting deviation on the classic pastry. If you like Ginger, give this a try. Sesame oil flake cake ($3.80) is an interesting name to a black bean filled, supposedly Mochi dessert. What we got was unexpected but okay. Crispy pork ($18) was expensive and had a nice crispy skin, but the meat was pretty bland and ordinary. Koi Palace’s service was a little better than average for a place like this. Servers were patrolling more often, so refills came often, although you still had to bark for a server to order. The breath of items was excellent, more extensive and more inventive than nearby places in Millbrae. Asian Pearl Peninsula and The Kitchen are the other restaurants that comes close. Koi Palace has high quality dim sum and a superb choice for lunch, but there are some items that are just average to slightly above average. Look through our review for ordering suggestions. Go early, right when it opens or around 1:30pm, as this will reduce your wait time. You can also call ahead and get a number by phone. If you do not know what to order, use our pictures as a guide. Check out our Lung King Heen, Hong Kong to see how the next level of quality and inventiveness in modern Chinese dim sum looks like. Service outside the US is one another level, that top Chinese restaurants abroad. Vancouver, BC Canada in Southern California’s Sea Harbour also surpass Koi Palace. Be sure to try the fun Moonstar seafood buffet located nearby. Hours: M-Th 11am-230pm. 5-930pm. Fri 11am-230pm, 5-10pm. Sat 10am-3pm, 5-10pm. Sun 9am-3pm, 5-930pm.